The process of technological progress is one of creative destruction, where some occupations, skills, products and firms become obsolete and are replaced by technologically superior alternatives. This process, facilitated by trade, improves overall economic growth and raises living standards in the long run. In the short run, however, it risks igniting economic and political tensions as some businesses fail and some people lose their jobs. At the same time, new jobs are created and the skills required to perform others might change dramatically. 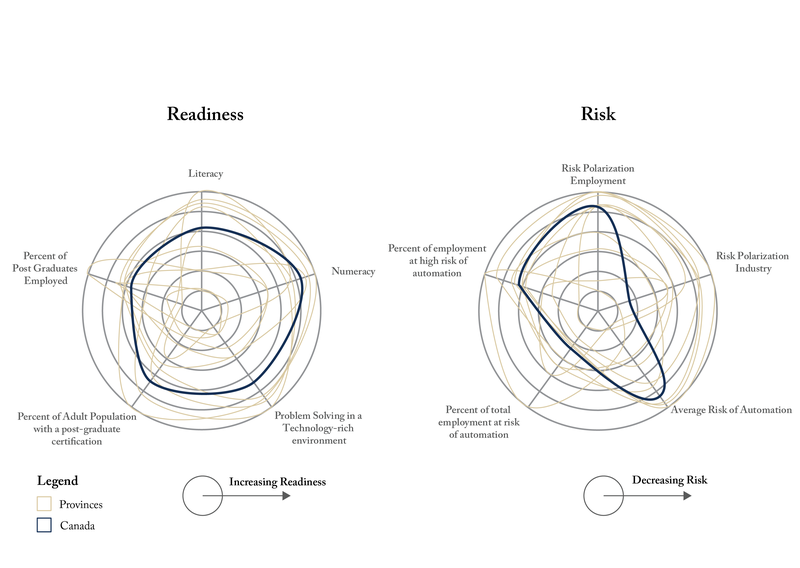 Incorporating various factors about each province’s labour market and economy, this Graphic Intelligence evaluates the risk of disruption in the labour market due to technological change and a measure of how ready workers are to adapt. Risk and readiness across Canada is shown relative to all the provinces and each province shown individually, relative to the Canadian average. Provinces with a lower risk of automation and higher readiness of workers to adapt are less likely to face labour market disruption are better situated for technological change than others. Each province faces slightly different challenges in developing policy to confront a technologically advanced and uncertain future. Provinces that face a higher risk of labour market disruption might require a broad-based approach, while those facing a lower risk of disruption might be able leverage existing policies and expand educational or unemployment support where necessary. To read more about risk and readiness on automation, read “Risk and Readiness: The Impact of Automation on Provincial Labour Markets” by Rosalie Wyonch.